Controversial legislation being touted by Kenya could see this African nation introduce the death penalty for animal poachers. Under current law, poaching attracts a life sentence in prison or a $200,000 fine. But animal activists says this is not enough. 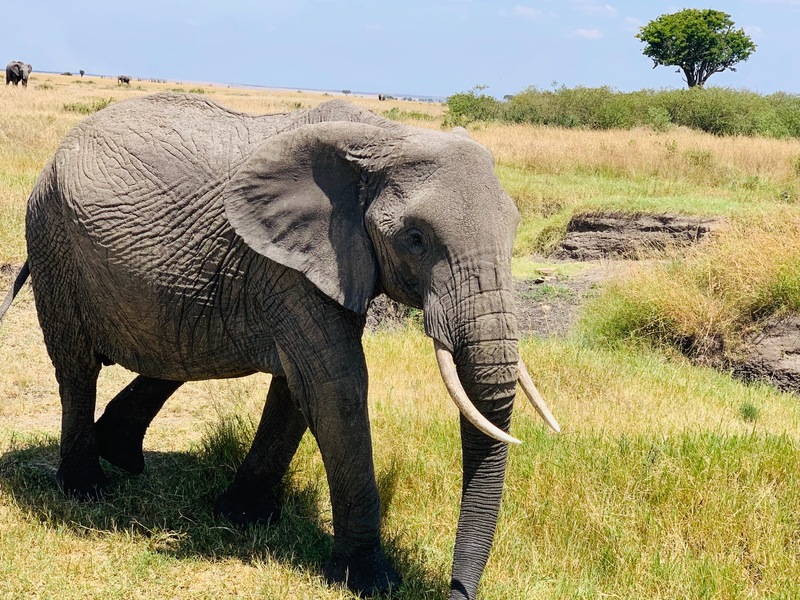 The Global Goddess travelled to Kenya with G Adventures in early April, to experience its amazing wildlife, including some of its 34,000 remaining elephants. 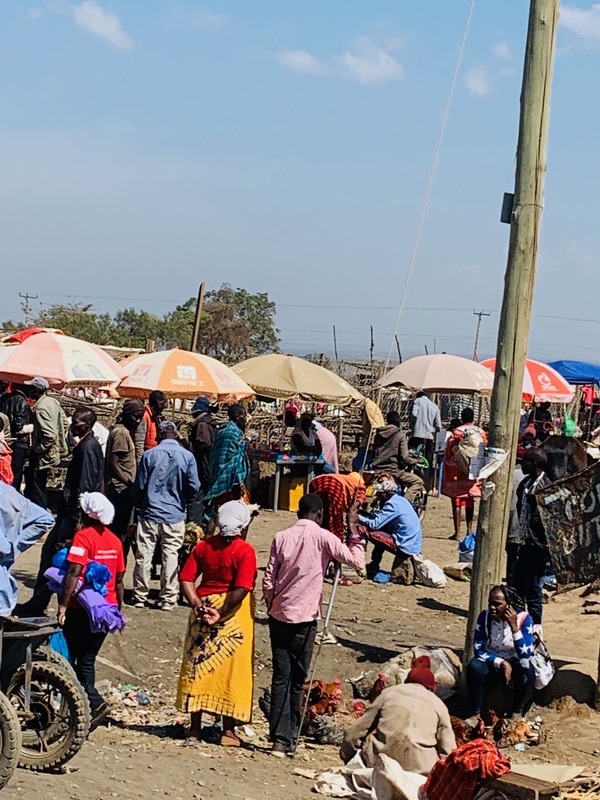 WE are bouncing on a lumpy, bumpy road, along a highway of cellulite and scars, past colourful, chaotic markets, travelling west to Kenya’s Masai Mara. Goats, sheep, shacks and shanties of corrugated iron punctuate the scenery, while babies as black as ink hang in slings over the hooked backs of their mothers. 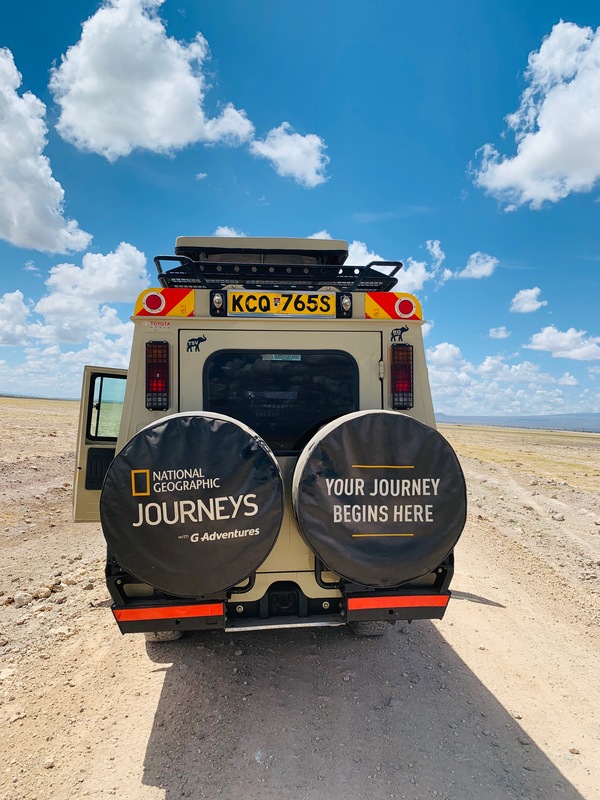 I am on an 8-day G Adventures National Geographic Journeys Kenya Safari which takes in the Masai Mara National Reserve, best known for its wildebeest migration; Lake Nakuru National Park, renowned for its rhino; and Amboseli National Park, acclaimed for its elephants. Shortly after Nairobi we straddle The Rift Valley – a 9600km gash which runs from Jordan to Mozambique – pausing in curious curio shops with jangles of bangles and throaty drums covered in goat skin. Big bottomed baboons cross the road which is framed by the cactus-looking Euphobia tree and Africa’s acclaimed Acacias. Just after Narok, the last town before the Masai Mara, the blessed bitumen concedes to undying dust, sharp stone chips and cavernous pot holes. In the Masai Mara National Reserve, they say you can hear the lions roar from five kilometres away. Outside our tents at Fig Tree Camp there’s a croc in the creek and a hungry, hungry hippo, or two. 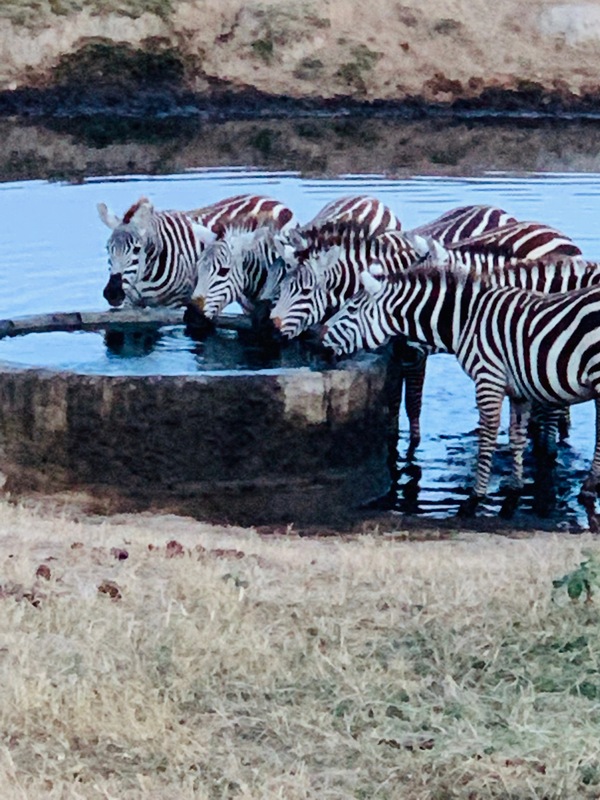 A late afternoon safari yields gazelle, zebra, buffalo, warthog, baboons and impala. A willy willy, or “Kinbunga” in Swahili dances in the distance around the thirsty earth. We stumble upon a cool school of hippos frolicking in their dirty day spa along the Talek River, while the vultures circle like an aeronautical show and a lone lioness crouches under a bush. A pack of hyenas, suckling their young, display their soft maternal side, while a marabou stork, with the widest wing span of all of Africa’s birds, perches precariously in a tree. 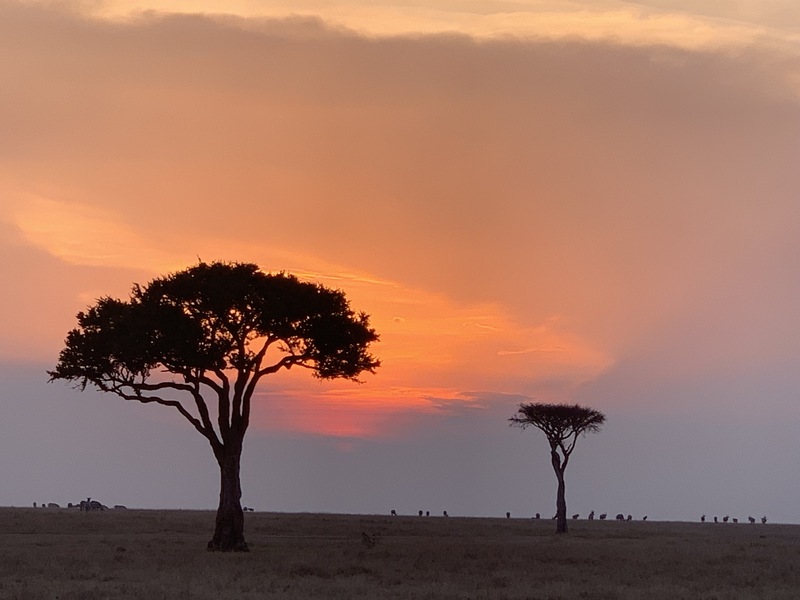 There’s even time to spot a leopard, with the same spring in its step as the jolly jumpy up-and-down Masai Mara people, before the flaming sun concedes to a purple marshmallow sunset. 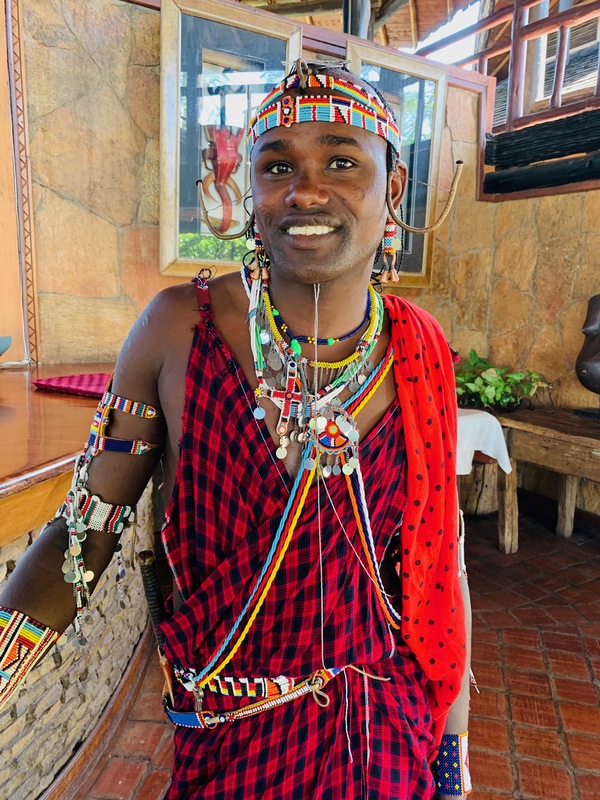 “The Masai happen to be the last group of Africans who are still living their traditional way of life,” G Adventures Chief Experience Officer and our guide George Njuguna Mwaura says. “They originated from the lower delta of the Nile River around the 18th century. They are pastoralists of semi-nomadic nature. “They believe all the animals belong to them. Anytime they go raiding they don’t feel guilty. The Masais do not eat game meat. “The Masais were pushed aside with white settlement and National Parks. Now they live right next to the National Parks because the land originally belonged to them. 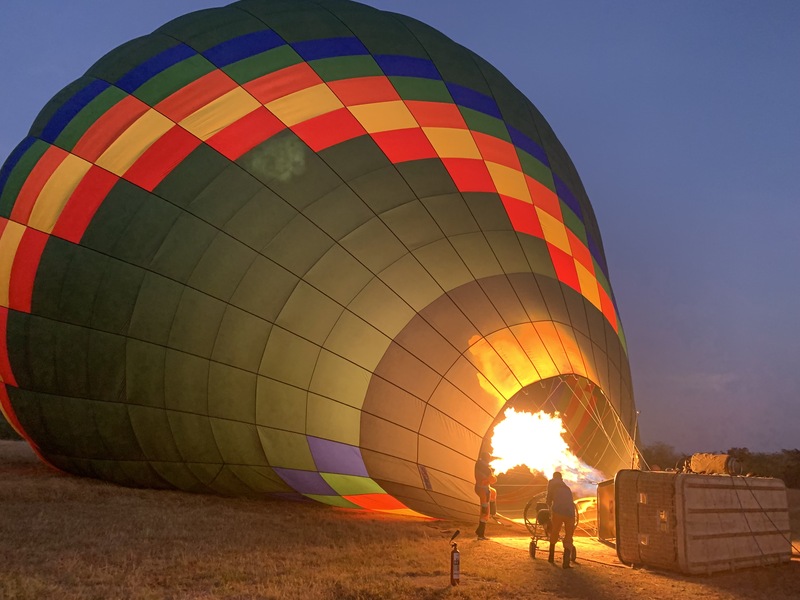 A new dawn ushers in a cool aerial safari in a hot air balloon where in the distance, a roaring lion sounds like a beating African drum. From the air, green shoots of hope are already peeking through the scorched, blackened ground from a controlled burn off, in preparation for the annual migration of wildebeest. Back on the ground, a dazzle of zebra stand top-to-tail to watch each other’s backs while a memory of elephants emerges from a mud bath. By the time the shocking pink sunset plummets to earth, it’s a day of the jackal. 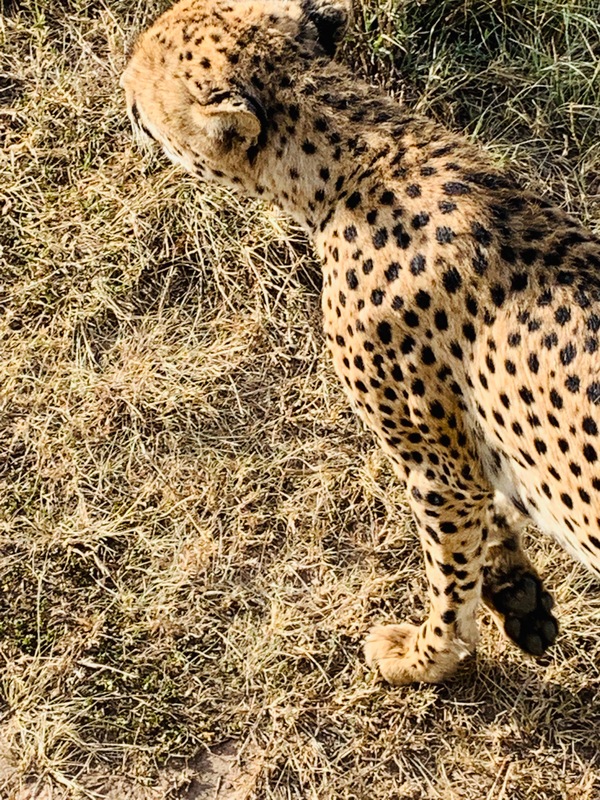 Cheetahs, known as the “terrorists” of the park, farewell our visit to the Masai Mara as we head towards Lake Nakuru National Park. Colourful churches, spurious shops and pastel pubs adorned with optimistic names line the highway. There’s God’s Victory Pub, Romance Salon and Cosmetics, and the Deliverance Church. At Lake Nakuru National Park, there’s a sassy secretary bird with its lanky legs, hooked red nose and quills on its head. But don’t be fooled by its amusing appearance of a county court clerk, it can kill even the most venomous snake. A wake of vultures is feeding on a dead buffalo while a hyena howls in the background. The rare Rothschild giraffe, found only in this park, stands loud and proud in the early morning orange light. Out on the lake, a flock of flamingos, coloured Barbie doll pink from the blue-green algae on which they feast, has gathered to gossip, while further along, a rhino and her calf are grazing on the grass. 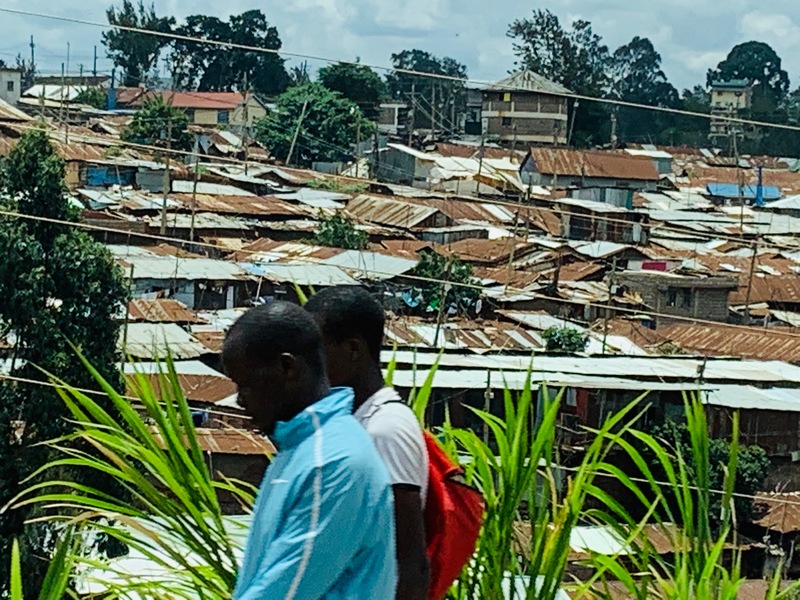 We head back in the direction of Nairobi, which means “the city under the sun” and past the Kibera Slum, home to 1 million people and the biggest slum in Africa. It is incomprehensible. But we are not done yet. 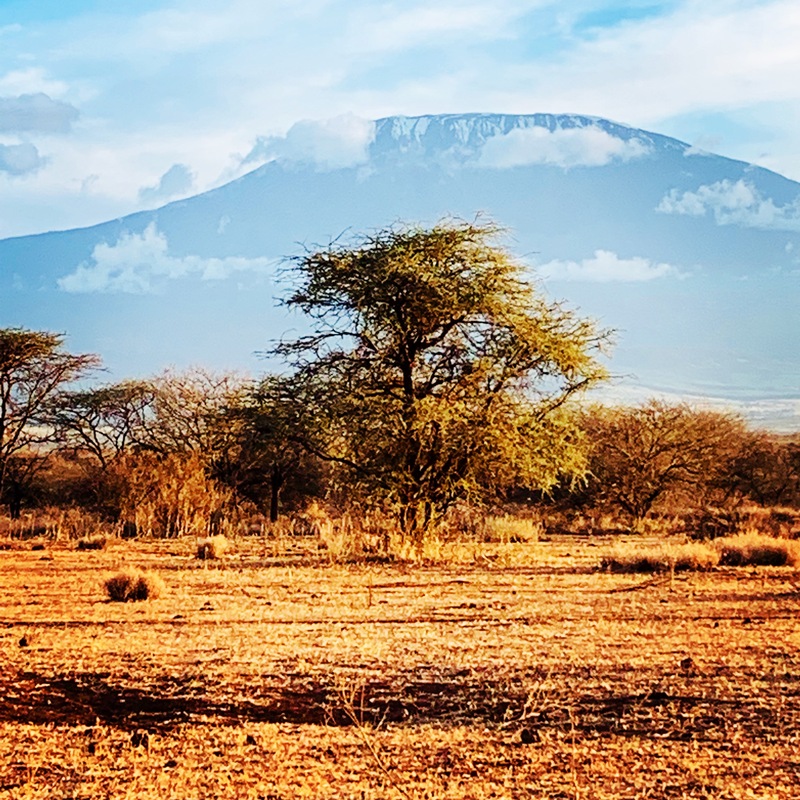 Before we leave, we have a date with Mount Kilimanjaro and Amboseli National Park. Standing at 5985 metres, Kili is the highest point in Africa and the tallest free-standing mountain in the world. 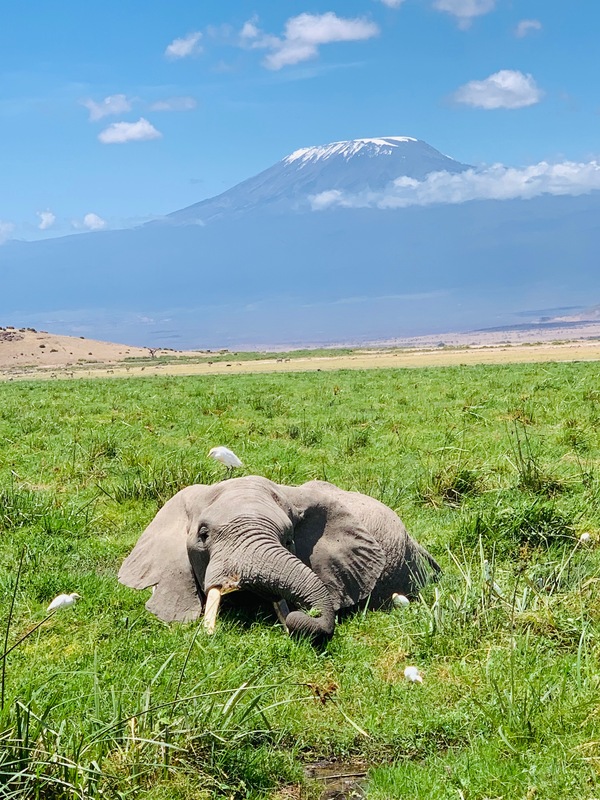 “What makes this park really popular is that you are standing in front of the postcard…Kilimanjaro, the elephant, the Acacia tree,” George says. “Different communities believe their Gods reside on the top of Kilimanjaro. When we are performing our traditional ceremonies, we pray. Even before the colonial people came, Africans believed in God such as the God of Rain. Out in Amboseli National Park there’s a troupe of yellow baboons, a zebra crossing, and a duo of vultures. There’s ostentatious ostriches teetering on their stilettos, spoonbill stalks and Egyptian geese. Meanwhile Kili flitters and flirts, at times shrouded in cloud, a mystery to even the Masai who wander her valleys. 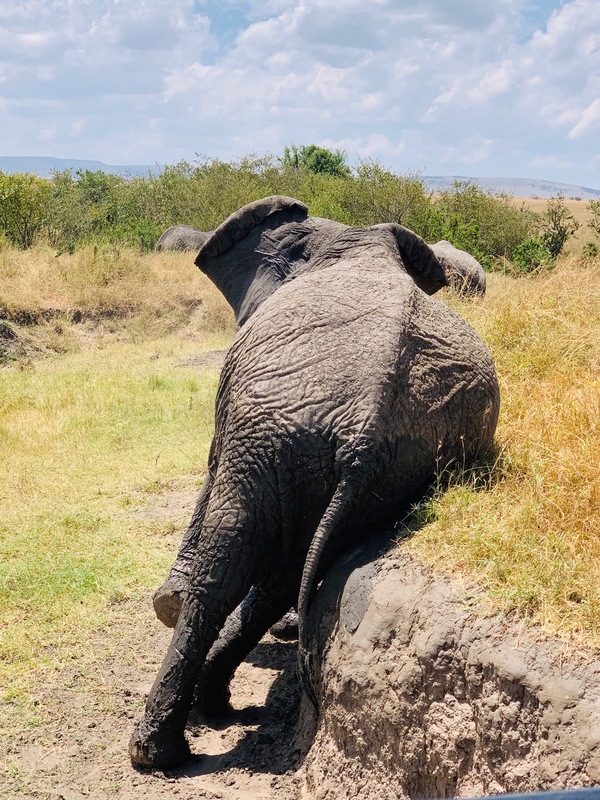 And somewhere, out in the park, stands Tim, the 48-year-old elephant with the huge tusk, who was once collared by park rangers to track his behaviour. But Tim had other plans and returned to the front gate, depositing the collar which he had somehow removed without breaking, and dropping it defiantly so it could be found. Tim has forged such a relationship with rangers that he will return to them each time he is injured, before cutting loose on the park to cause more havoc. And in many ways, this emotional elephant captures the soul of Kenya. Playful, defiant, oozing spirit and soul. Mother Kenya bleeds red. Rusty soil, the crimson cloths of the Masai warriors, the blood of her wildlife kills and her blushing, beating heart. She is simultaneously giving and gritty. Water may be a precious commodity here, but hope, she springs eternal.